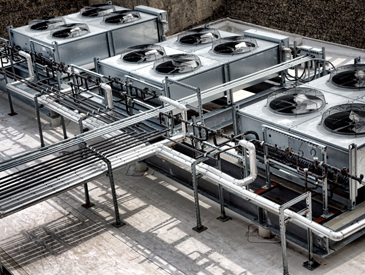 Residential and commercial buildings rely on many forms of cooling systems to keep people, animals, food, chemicals, etc. cool and comfortable. The most common systems are air conditioning or HVACR units, but there are also many refrigerators, freezers, and dehumidifiers used. When these units are serviced, the refrigerant gasses within the system must be removed and placed into a storage tank, then cleaned to remove impurities and pumped back into the unit. Many HVACR units, walk-in refrigerators, deep freezers, etc. continue to require scheduled and unscheduled service during the cold season. The cold weather can cause unique problems for refrigerants and service technicians. Cold weather causes the pressure inside a cylinder jug to drop. 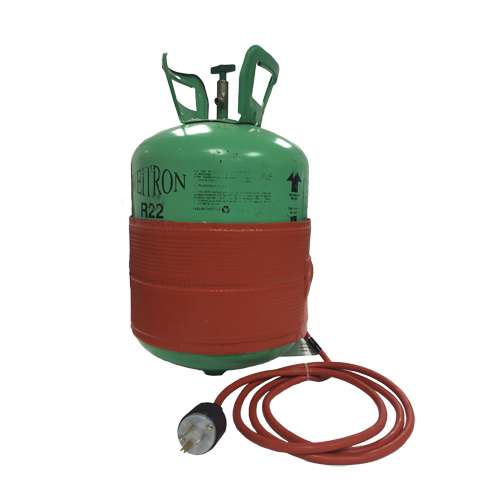 At 0°F (-18°C), the pressure coming out of a jug of R22 Freon® is only 24 PSI. When the system being serviced is running, the suction pressure will be near 60 PSI or greater. Prior to servicing, the surface temperature of the cylinder must be elevated to approximately 100˚F (38˚C) or greater to maintain adequate pressure inside the cylinder. BriskHeat’s HVACR “Hot Belts” are ideal heaters for pre-heating and keeping refrigerant cylinder jugs warm. The plug-and-play heaters fit snugly around the cylinder to warm the contents so that refrigerant gas can be effectively discharged during servicing. The heaters have an adjustable strap to fit any cylinders with diameters between 9” (23cm) and 13” (33cm). This fits the most common sizes of 30lb, 50lb, and 125lb cylinders. A built-in controlling thermostat maintains cylinder surface temperature at approximately 120°F (49°C). This ensures that the refrigerant is kept at an optimal operating pressure for servicing. The HotBelt heater is safe for indoor/outdoor use and grounded for safe operation.